Buckets: Not just for heads anymore! 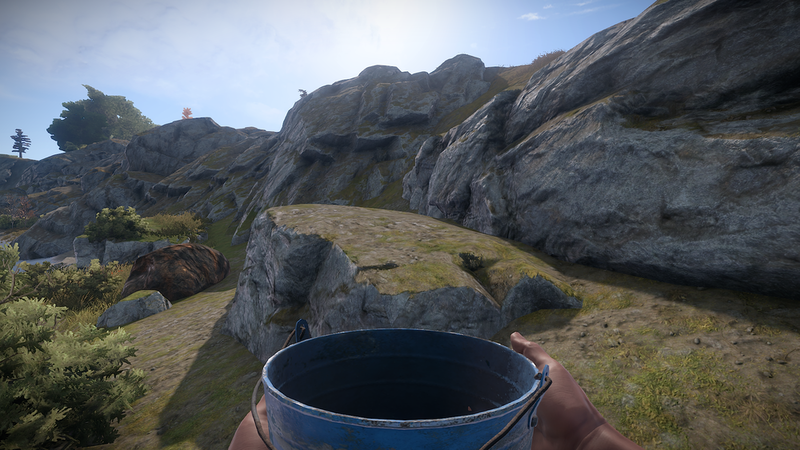 A new mechanic of the game is on its way: Water buckets and barrels. Due to go live with the update tomorrow, these items provide a new way to store and handle water. The water bucket does exactly what you'd expect: Go to a water source (a lake or river), fill up the bucket (by holding left click), then carry water in said bucket till you’d like to toss it on a fire or into a barrel (by pressing right click). Watch out, if you switch to another item with a full bucket, all that water will splash on the ground. You guessed it, the water barrel stores water. Take a full bucket to a barrel, right click, and the barrel fills up. 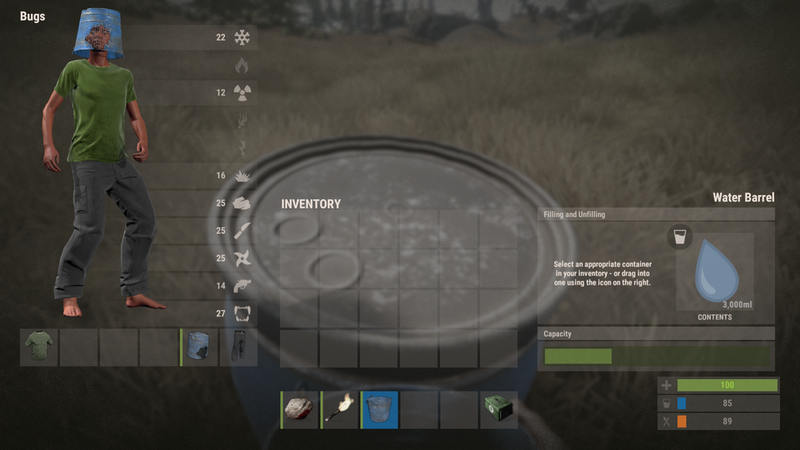 It holds about 10 buckets of water and can be placed inside your base or out. I know, I know, at this stage of the game, water is not very significant. Sure, I drink it when I come across a bottle. But if I want to put my campfire out, I don’t need a to throw a bucket of water on it (although that does work). Also, the inferno at a helicopter crash site burns too hot to reasonably be put out by some buckets (I already asked Helk). That said, this new functionality will help you on the off chance someone comes by with an incendiary rocket - it’ll put out those flames in about 2 buckets. Also, remember that nifty little flamethrower which was being worked on the other month? I can imagine buckets of water will come in handy the first time some motherfuckers start torching your property from head to toe. With these additions came a protocol++. That means you’ll need to have your client opted into the staging branch before you can see the server. Click here for instructions on how to do that. I’m happy to report: Our new dedicated box has arrived. This will allow us to split our current load in Chicago, re-open our Savas server, launch a prerelease server (to test the new XP system), and maybe more (pending resources). It should be set up later today and I plan on completing the transfer before the update on Thursday. Don’t worry, no data or blueprints will be lost (but you may need to update your favorites for medium and hapis).